Fernando Alvarez de Toledo: born, 1508; died at Thomar, Portugal, 1582. A famous Spanish general who fought in the various campaigns of the Emperor Charles V. and of Philip II. After winning several decisive battles, he was sent as governor to the Netherlands in 1567 to suppress a revolt against Spanish tyranny, and became the most cruel and rigorous supporter of the Inquisition. He established, and presided over, the Council of Blood, the victims of which doubtlessincluded Jews as well as Christians. It seems to have been Alva's intention to rid the country of Jews. To the city council of Arnheim and Zütphen, for example, he wrote that in case any Jews were found in those places, they were to be arrested and held until further orders from him. 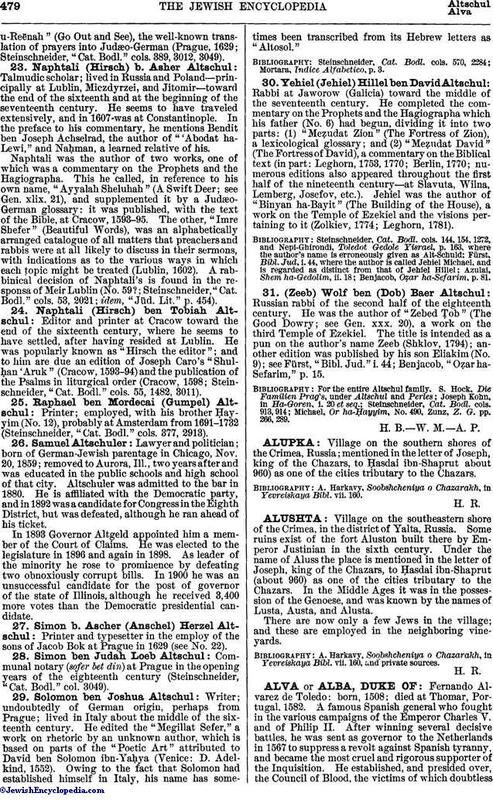 The council evidently anticipated Alva's desire in the matter; for its report read that "there were no Jews among them." 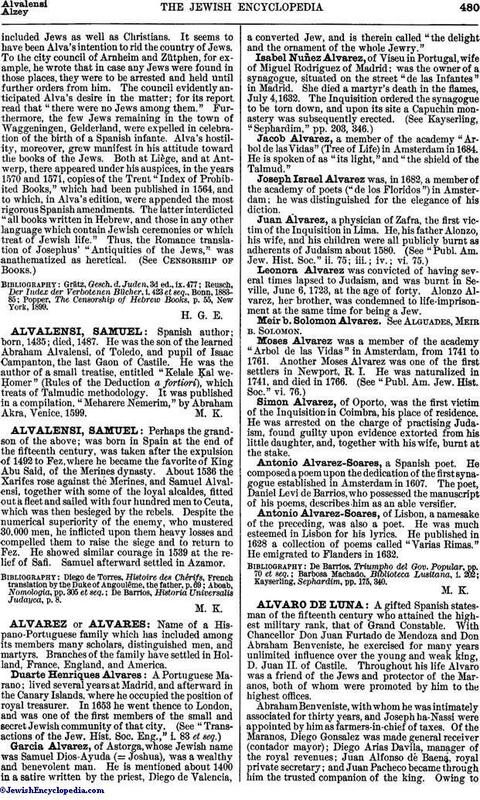 Furthermore, the few Jews remaining in the town of Waggeningen, Gelderland, were expelled in celebration of the birth of a Spanish infante. Alva's hostility, moreover, grew manifest in his attitude toward the books of the Jews. Both at Liège, and at Antwerp, there appeared under his auspices, in the years 1570 and 1571, copies of the Trent "Index of Prohibited Books," which had been published in 1564, and to which, in Alva's edition, were appended the most rigorous Spanish amendments. The latter interdicted "all books written in Hebrew, and those in any other language which contain Jewish ceremonies or which treat of Jewish life." Thus, the Romance translation of Josephus' "Antiquities of the Jews," was anathematized as heretical (See Censorship of Books.). Popper, The Censorship of Hebrew Books, p. 55, New York, 1899.